Okay. Here's how it's done. Most simply, a Standard TRASH TIE may be worn as a barrette. Simply bend the tie in a gentle "V" shape and insert it into your hair. Then fold the ends over your hair. Make sure the ties touch in the middle somewhere so your hair won't twirl out. Cinch tight. You can wrap once, wrap twice, or twist! I prefer to wrap them twice in most cases (petite & super secure!). To see these options up close, click on the photo to enlarge. 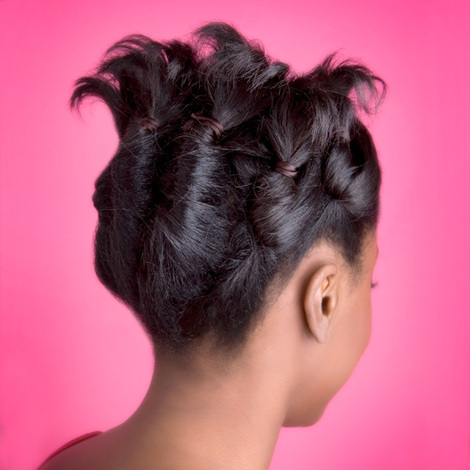 Create a soft, modern style or fasten some playful braids. For up-dos, simply fish the folded tie through the hair next to your head and through or around the hair you'd like to hold in place. Cross the ends over securely and voila! The action is much like inserting a big ol' bobby pin, but because the ends get crossed tightly over your hair, TRASH TIES won't slip out like bobby pins can. And they're cute, so you don't have to worry about hiding your means! No shame. You can plan out a neat, tidy 'do like the one above. 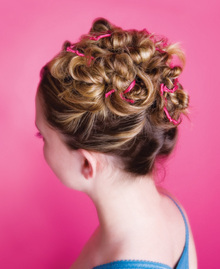 But, one of my favorite things about using TRASH TIES for up-dos is that you certainly don't have to. You can create a rather glamorous effect just by going at it willy-nilly-o; tie this bit of hair here, then this pretty little knot over there, and so on. Just add more ties until you've got the look you're going for. That's what we did in the picture at the right, and look how cool it is! 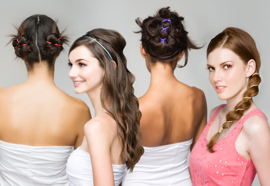 When it's time to let your hair down, simply unfold each tie and they'll release from your hair without tangles. • TRASH TIES are also available in 25" lengths. To see how they work, visit The Basics page for our Long Ties and have a look through the TRASH TIES Gallery. Long ties work a bit differently and can also do all kinds of crazy, creative and beautiful things. • You can combine both lengths of TRASH TIES to create limitless hair styles. Stay tuned at the TRASH TIES Blog and we'll show you some fun ways to go beyond what's included in the 16-Page Style Guide that comes in each box. • Many hair styles may be created where TRASH TIES won't even show. To do so, select TRASH TIES that blend with your hair color. • With a drop of soap and a quick rinse, TRASH TIES are hand-washable. • With proper care, your TRASH TIES will see you through many good times! So Go Get Yourself Some! TRASH TIES make great fun and great gifts. They can be worn in the simplest, most elegant way or in a modern, playful fashion. They're perfect for everyone. And as they're not available any where else just yet, you can bet your loved ones have never seen 'em either. Accept no substitutes! Heather holds the one and only patent on this idea and not only invented the product, but the entire concept -- and all of the techniques & styles associated with it. Hi! Welcome to the Trash Ties™ blog where you can keep up on all the news and happenings of the coolest new hair thingie. Invented by designer Heather Bailey, patented Trash Ties are a modern solution for troublesome tresses. In keeping with Heather's mission to spread the joy of creativity, you too can join in the Trash Ties fun through contests and challenges and by posting your Trash Tie hair-do's in our fun and funky photo groups. Get creative, have fun, look fabulous... and tell all your friends about Trash Ties! Your comments and questions are important to us! Wherever possible, we'll try to answer your questions in the body of a post or in the comments section. Please check back here for answers to your questions or email us at info@TrashTies.com. 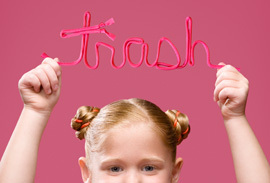 Trash Ties™ and The Coolest New Hair Thingie™ are trademarks of Heather Bailey, LLC and Trash Ties products are patented. Infringement upon the patent, copyright, and/or trademark rights of Heather Bailey, LLC will be vigorously pursued. Do not copy artwork nor take images or content from this site without explicit permission.